It’s that time of year Spring is around the corner, rides are being planned, and riders are planning their rides. For those new to the Club and/or new to cycling, Club rides have a lot to offer and very little to fear. I’ve had a few people tell me that it would have been nice to have some sort of guide of what to expect with regard to riding with the White Clay Bicycle Club (WCBC) once you become a member. In an effort to answer some of the questions I have received, below is (i) an explanation of the Ride Calendar, (ii) suggestions on how to select a ride, (iii) what to do once you find a ride you would like to join, and (iv) other details to help you become an active, participating member. 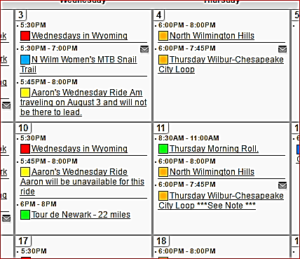 The Ride Calendar is where the Club’s Ride Leaders post Club-led rides. Anyone is welcome to join these rides, whether or not you are a current member of the Club. We hope that – after a few rides – you decide to support the Club and become a member, but it is not required for participation. 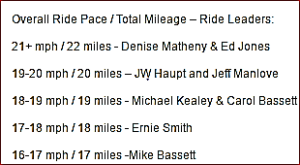 Rides are posted on the Ride Calendar with brief descriptions about the ride, including details regarding route length, terrain, pace (or speed) of the ride, anticipated stops, and other facts that the Ride Leader thinks those riding should know. Typically the terrain can be described as flat, rolling or hilly, with each being a little more difficult and challenging for a rider. Ride length in miles is usually provided, but not always ride length in time. To determine how long a ride will take from start to finish, take the length of the ride and divide it by advertised pace (sorry to throw in a math problem) and you’ll have a pretty good idea. By example, a 35-mile ride at an advertised pace of 13-15 mph will take about 2-1 /2 hours, maybe three if there is a rest stop along the route. When planning to join a ride, always assume a ride will take a little longer than anticipated because of unknowns (flat tires, mechanicals, etc.). The Ride Calendar shows the rides listed for each day according to start time and are color coded to show you the advertised pace of the ride. See the legend at the lower right of the calendar to know what colors are used to designate what pace. Rides can be posted at any time, but must be posted at least three days in advance for the Ride Leader to get credit for leading a ride. 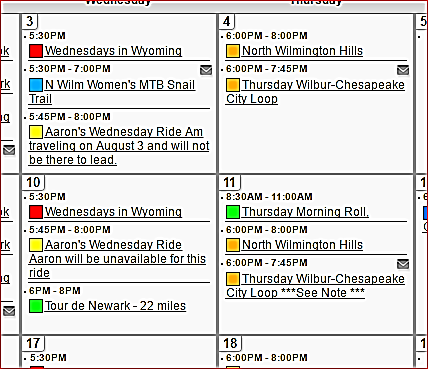 Check the Ride Calendar frequently for new ride postings or even edits to current ride postings. Inclement or extreme weather (rain, severe heat, thunderstorms, snow and ice, freezing temperatures, etc.) may postpone or even cancel a ride, so check the Ride Calendar in advance of a ride if conditions are questionable. Cancellation or modification should happen two hours or more in advance of the posted ride’s start time. The difference between the advertised (or average) pace and the rolling pace is something that needs to be considered when selecting a ride. Advertised pace is the speed you will see on a computer at the end of the ride. The rolling pace is how fast the group will be riding on a flat section of road. 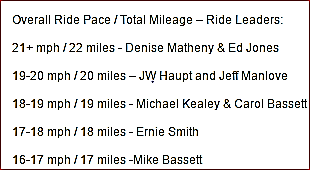 On a relative flat to rolling terrain ride, the rolling pace will be 2-3 mph above the advertised pace. For example, a flat to rolling route with an advertised pace of 13-15 mph means that the group will be riding along at 15-18 mph on a flat section of road, with the speed decreasing on the climbs more than would be made up on a downhill meaning that when complete the average pace of the ride will be between 13-15 mph. A common misconception is that a ride listed at 13-15 mph means that the group will not go any faster than those speeds when traversing a flat stretch of road. As a general rule of thumb, add about 2-3 mph to the advertised pace for the rolling pace. If this is faster than you want to go or think you can go for the duration of the ride, then it might be better to find a slower paced ride, especially when you are first starting out. Although some like a challenge and like to push themselves, it is better to start with realistic estimation of your level of fitness, than to overestimate it. Start with a group that you think that you can comfortably complete a ride. If you do well and are never in distress during the ride, then consider stepping up to the next level by joining the next faster group. 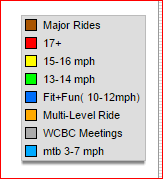 If you check the Ride Calendar you’ll find some locations offer “Multi-Level” rides which provide rides of different paces starting and ending at the same location such as 10-12 mph, 13-15 mph, 15-17 mph, and so on. Why ride with a Group? That’s a question that over the years I have found easier and easier to answer. Group rides are just that, a group of people that share a common interest – cycling. When you do something with a group that shares your interest, you create an almost instant bond because of that. I’ve done entire rides occasionally talking with someone on a ride about cycling topics and at 0the end of the ride realize that I don’t know the person’s name, yet we spoke for a couple of hours. 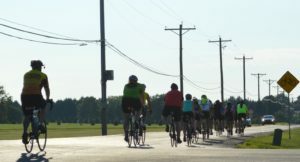 Riding with groups can provide for safer riding conditions. Should you have a mechanical problem or worse, an accident, riding with others can provide a level of care and assistance that riding alone does not. Riding in groups makes you more visible to automobile traffic. A single rider might blend in with the background due to the small size, but with a group of 4-5 or more and the group is a long or longer than an auto and much more obvious than a single rider. 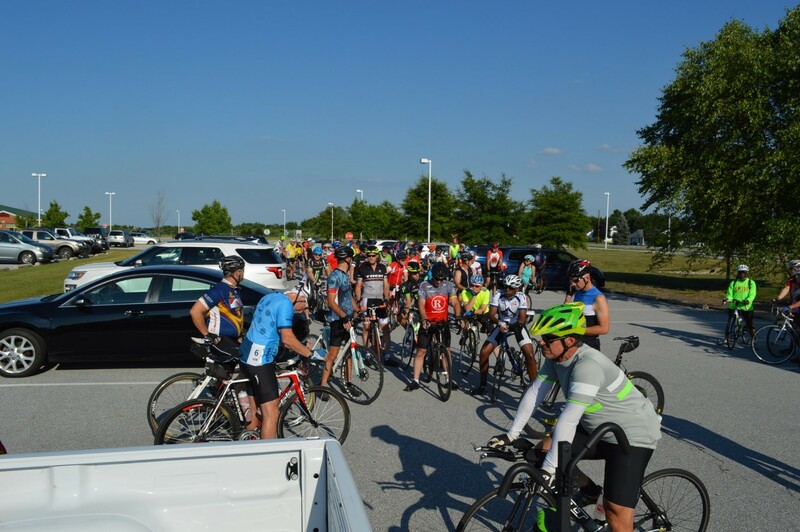 The first time you show up at a group ride you may feel intimidated by the sheer number of riders you find at the start of the ride. The best thing for you to do is take a few deep breaths, calm yourself (10 years of riding and I still get butterflies before the start of a ride), then ask someone to point out the Ride Leader. Introduce yourself to the Ride Leader and talk with them about what to expect on the ride. If this is a multi-level ride, then you should ask for the Ride Leader with which you plan to ride (any Ride Leader at the ride should be able to direct you to the right person for your group). If you are jumping into a mid-level group, let the Ride Leader know that this is your first time with the group, how often you ride, how far you typically ride, what your rolling speed is when you are riding in the flats alone and, ask them if they think that you are in the right group. The Ride Leader may suggest that you ride at the back of the group to allow you to observe the group, how the riders move about, how much space they keep between themselves and, how they communicate (both verbally and with hand gestures). You’ve arrived, talked with the Ride Leader, read and signed the ride waiver, let a couple of butterflies go…now what? Get ready for the ride. Find your helmet, water bottle(s), gloves, energy bar, shell (windbreaker jacket), shoes, sunglasses, bike computer, headlight, taillight, etc. Oh, and your bike! Get your bike ready first. Follow the “ABC’s” of cycling: A – make sure your tires are inflated with Air; B – make sure your Brakes are working properly; C – make sure that your Chain is lubricated. If your tires are low, pump them up. (Don’t be afraid to ask around if you’ve forgotten your pump – most cyclists are more than willing to share!). If you need help figuring out how to attach their pump to your tire’s valve stem, don’t be shy, ask for help. Next throw on your helmet and go for a brief ride around the area to make sure your bike feels right, that nothing feels loose and most of all – check that the brakes work. Again if something doesn’t feel right, unless you know how to fix it, ask someone for help. Most Ride Leaders have a working knowledge of bikes and can either help you or point you in the direction of the local “bike mechanic” who should be able to help. Need a tool, don’t be shy, ask. When your bike is ready, finish getting yourself ready by putting on your shell, glasses, gloves, etc. until you are all ready to go, lock up the car and check the time. If you are ready early enough ride around to get warmed up before the ride and one last check that your bike is working properly. If you are not early, then roll over to the group that has gathered with the Ride Leader with whom you will be riding and get ready for the start. The Ride Leader should give a safety talk just prior to the start of the ride. Listen carefully as the Ride Leader will share information about road conditions, detours that may be required, weather related warnings, reminder about calling out road hazards, etc. This is your last chance to ask questions of the Ride Leader prior to the start of the ride. Again, don’t be shy, ask. So you’ve had a successful ride with a group. You’ve been bitten by the cycling bug, now what? If you’re like me, there is no cure, so you’ll need to find another ride. Check the Ride Calendar, find a ride that that interests you and that suits your level of fitness, and then come out and join us. You’ll be amazed at how much fun riding with a group can be. The places that you will go, the people that you will meet, and the friends that you will make. ← Icicle 2017 – This Saturday (03/25)!